This is a spectacular two story apartment with an incredible view to the River, located just one block for the famous Libertador Ave. and it is situaded in an upscale neighborhood. It is very bright and quiet, with a large balcony with BBQ. The apartments offers on the first level a large living room with confortable sofa and many windows allowing ample natural light. . It has a dinning area with an elegant table and chairs. The kitchen is fully equipped and there is a guest toilette and separate office where you can work or check your e-mails. There are two bedrooms upstairs, each with the highest quality queen-sized beds and air-conditioners in each room. Between the bedrooms there is a full bathroom with shower and Jacuzzi tub. The views from the bedrooms are amazing. Highly recommended. 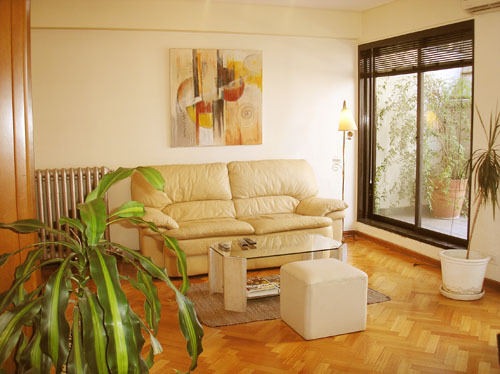 Very bright, nice, quiet, balcony with BBQ and amazing view over the city, great location, 5 minutes from Recoleta. Elegant and nicely decorated.24hs security, excellent building. Three air conditioners, central heating. Cable TV, DVD, Hi-Fi Stereo. Internet Wi Fi. Downtown, parks, plazas, 5 minutes from Recoleta. Banks, exchange house, museums, restaurants, pubs, bars, nightlife area, commercial area, residential area. Included: Electricity, gas, water, expenses and city taxes, TV cable.